On one of my many voyages across the border into New Jersey, I found smoked BBQ heaven. Although Allentown has everything from Mexican to Ethiopian food, it’s always been missing a solid BBQ joint. Phillipsburg is only a quick 20 minute drive from where I live so I consider that reasonable for a BBQ fix. 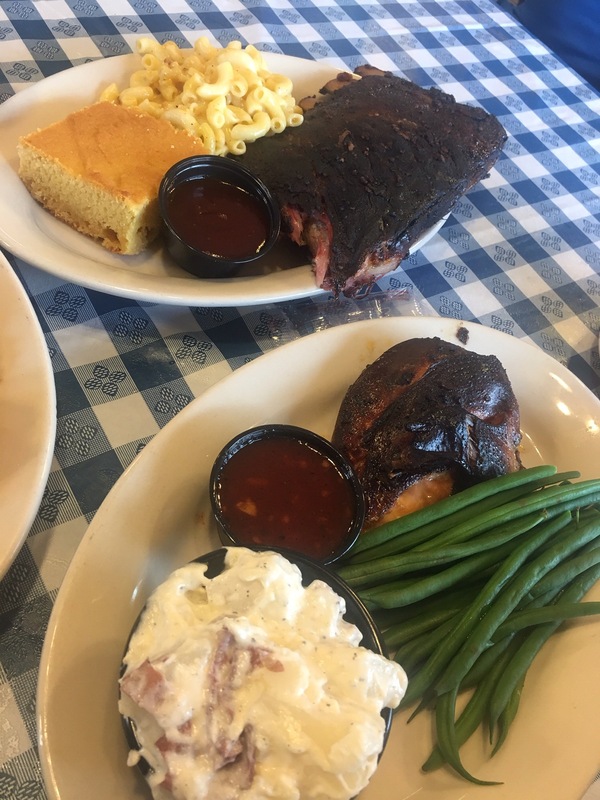 Sauce N Smoke has only been open a short 6 months but has began to make a name for itself with a busy crowd of people either going into Jersey or leaving. Fresh meats are smoked on the premise daily to fulfill the cravings of everyone that’s stops in. There’s ribs, chicken, pork, beef and smoked fishes so there’s something for everyone. I will be publishing a full formal review through the Morning Call next Wednesday on this place so stay turned for more details. Here’s a quick review to get your taste buds going. I went on this voyage with my older brother Mike. He’s somewhat of a picky eater so I have to save this traditional places for my friends like him. The most impressive thing about the menu was all the sides available. Potato salad, Mac & cheese, green beans, corn bread, fried okra, mashed potatoes, and rice with beans all for the taking. I was impressed by the array of options until we actually ate. My brother order half a rack of the smoked ribs with a side of sweet baby rays for dipping. The ribs LOOK burnt, were actually quite tender and delicious. The ribs were slightly pink on the inside still and had major smoky flavor with every bite. As sides, he ordered Mac & cheese which was tasty, but not quite as good as the one I blogged a week ago. Just saying. He also ordered corn bread which is unusual for him but it was soft and moist and just like any other piece of regular cornbread. I ordered the smoked BBQ chicken. Something about the warm weather approaching has gotten me in the mood for good BBQ food, especially chicken. I chose a hearty chicken breast with the house BBQ sauce which was amazing. Minced garlic gave the sauce a real savory taste that was dynamite with the smokiness. The potato salad was a slight disappointment. I have had the dish with vinegar before but this seemed to have just a little too much vinegar. The potatoes were cooked perfectly though and there was a nice bite despite the overwhelming flavor. The green beans were just flavorless, regular steamed green beans. The sides were a disappointment, but certainly not a deal breaker. The main focus is the smoked meats and they were delicious so they win in my book. 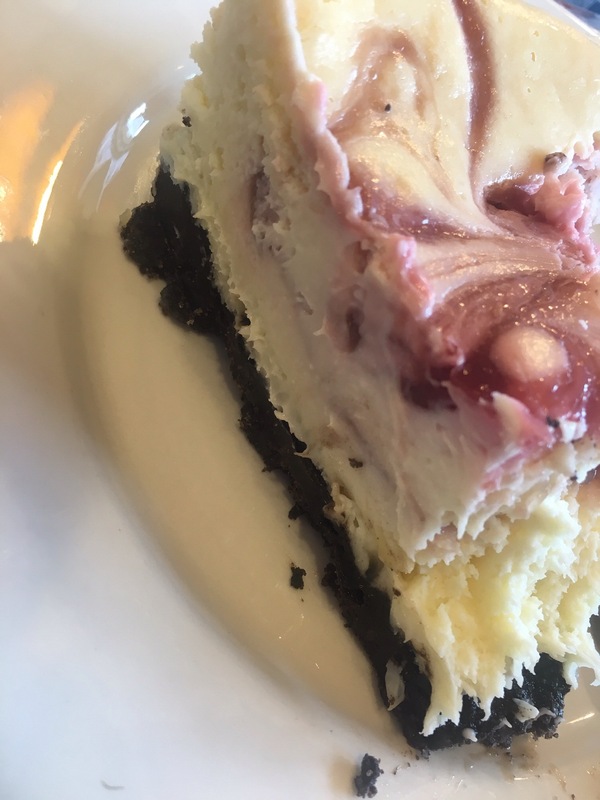 For dessert, I had a huge piece of raspberry cheesecake with an Oreo crust bottom. Yes you just read that right. It was handmade by the owners wife which was a nice touch. Super rich and creamy and worth every guilty bite.